Bible on a Washing Line!?? When I gave up working in a stable, full-time job this time last year in order to pursue a creative streak, I thought I had a good idea of where that would take me. I had a plan to write, commercially, and grow a freelancing business as quickly as possible. However, as soon as I gave a bit of space to my dreams, they sort of got a life of their own and I got drawn into some projects in a way I had not anticipated. One of these projects was a small theatre company, started by a good friend, James Robinson (AKA noahsapprentice), who has always had a knack for persuading me to do odd things like helping him to give a seminar dressed as a pirate and toting an accordion. 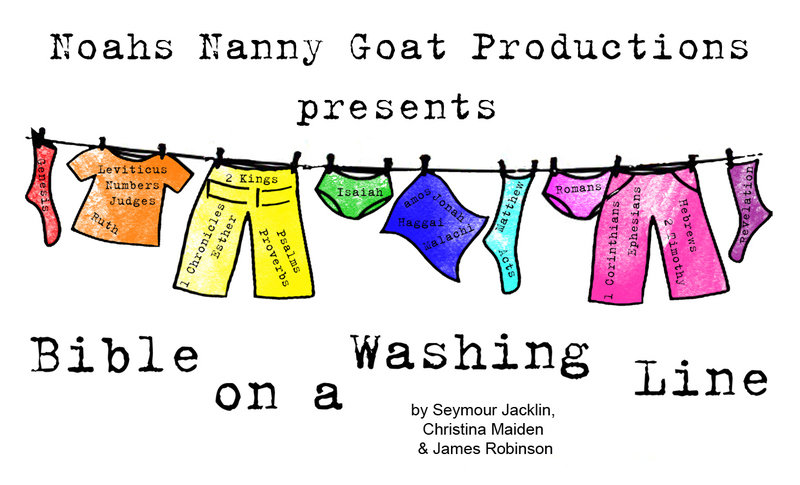 The opportunity to get involved in performing as part of “Noah’s Nanny Goat Productions” seemed to draw together the threads of my passion for communicating with not just the written word but the spoken and acted word as well. This year, being the 400th anniversary of the publication of the King James Bible, has sparked a renewed interest in the Bible and a host of initiatives under the the banner of Biblefresh that seeks to restore some level of biblical literacy to Britain and explore fresh ways of presenting scripture. It seemed like a good moment to jump on the band waggon and the fruit of some eight months of writing, rewriting, wrestling and rehearsing is at last apparent in our first ever show, “Bible on a Washing Line”. The "washing line" bit is because ... oh, it will take too long to explain ... Just come and see the show! A year ago I never imagined that this is what I’d be doing and it goes to show the thrill and the danger of taking risks and opening up to wider horizons. We are even taking BOAWL on tour. The show is about an hour and twenty minutes long with no interval and takes the audience on a frantic tour through the Bible, looking at some well known and some less well known characters and stories from the Bible. It is fast and funny and hopefully provokes people to think as well as laugh. It is basically a series of short sketches based on “Top Tens” from the Bible, including the top ten deaths (which is set in a forensic lab), the top ten relationships (a reality TV show), the top ten foods (a restaurant) and the top ten animals (a zoo). The website is: noahsnannygoat.org.uk and tickets for the tour can also be bought on the website. More dates and venues to be announced. I hope you have a great success on your hands! Thank you very much, Mister Anchovy!